The New Philharmonia Orchestra is bringing a fantastic St. Patrick’s Day concert to Newton. The event combines classical music, traditional Celtic music, and audience sing-a-long favorites for an evening of great community fun! The event kicks off with a party featuring traditional Irish fare, a craft beer tasting, and strolling Irish musicians. Performances will follow the reception and will even include Irish dancing! 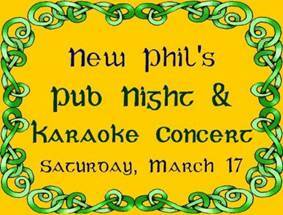 Saturday, March 17th at 7:00 p.m.